p cubed presentations > Latest posts > p cubed > Just talk. Just talk. When presenting one must have a message that works for the individual audience. Those presenters who simply talk or list facts are just a clanging bell. 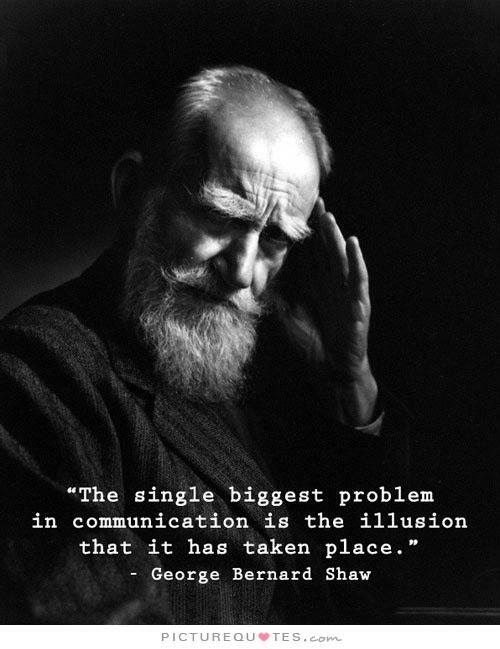 As George Bernard Shaw perhaps said ‘The single biggest problem in communication is the illusion that it has taken place’. A presentation is more than just talk. Don’t think otherwise. The blog post from Rich Simmons deals with this issue in our management communication but it is as pertinent for presentations. Many believe that simply speaking for their allotted time (or more) on the stage represents effective communication. This is an illusion held by the majority of teaching programmes, scientific meetings and public gatherings. Talk is just noise unless it has a purpose and a message. Talk is just talk. The purpose of a presentation must be clear in its construction and can only relate to the audience needs. Start with the idea of learning, rather than teaching, of inspiring rather than lecturing or challenging rather than chastising. An audience will only engage with a message. A list of facts could be eloquently delivered to the wrong audience; its supportive media and delivery do not make it effective. It’s just talk. Don’t. All too often a teaching type presentation mirrors the textbook from which the information has been culled. This is faithfully transcribed onto the slide set and the presenter will just talk. Don’t do this. The audience will bore very quickly because it is simply just talk. The most efficient method of transferring large volumes of data from one place to another is as a document; the least efficient method is as a presentation. There is no emotional engagement and even for scientific fact, that is essential. It must matter to the listener otherwise it remains just talk. Once an appropriate message has been constructed and understood by the presenter the best advice for delivery of this is to just talk. Don’t read it to the audience but talk, as a conversation and engage the audience. It is exceptionally difficult to read a script to an audience and maintain their attention; only broadcasters and actors even come close to achieving this. Conversely, any presenter who steps onto the stage with their message crafted and decides instead of reading to just talk will be embraced and their message valued. The humanity and emotion of a presenter who can just talk, represent the pathos Aristotle spoke of. There has to be a logic and importance to support this but ultimately when that message is there its reception is down to the presenter being able to just talk.